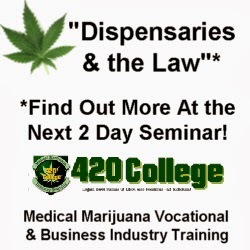 California Cannabis College marijuana business seminars are private events, starting at 10AM-4:20PM. Class locations and details are given after completion of enrollment. The cost of the seminar is $300. – anytime – you will have all the instructions in detail written for you and most of the forms that you’ll need to file, an up to $1,500 value and saving you valuable time. You can contact us here to have a California Cannabis College Admissions representative assist you if need help enrolling. We promote non-profit Medical Marijuana Businesses in areas where there is a need for compassion for the local medical marijuana patient community. For profit medical marijuana businesses are illegal and the only way to operate safely in the state of California is as a non-profit corporation. adopted the medical marijuana patient programs, please check our FAQ page for state by state breakdown on laws in states that have this program in place. California Cannabis College does not promote illegal sales or use of marijuana. That is why we strongly urge you to take our seminars to get the latest in developments and laws concerning medical marijuana and cannabis industry. Please check with your state and county for your local laws regulations.